The day I've been alluding to for months (and months) is finally here. 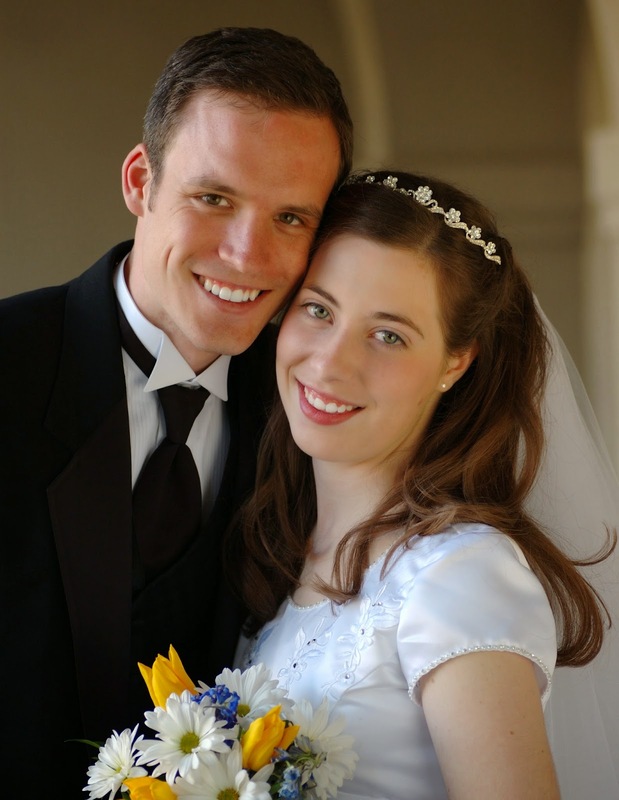 Today Mike and I are celebrating ten years of marriage. In many ways, we still feel like newlyweds, but then something will happen that brings the reality crashing down on us. For example, a few weeks ago, we arranged a blind date between my sister and a friend's son. Mike and I decided we should double with them since we were the mutual connection between them. 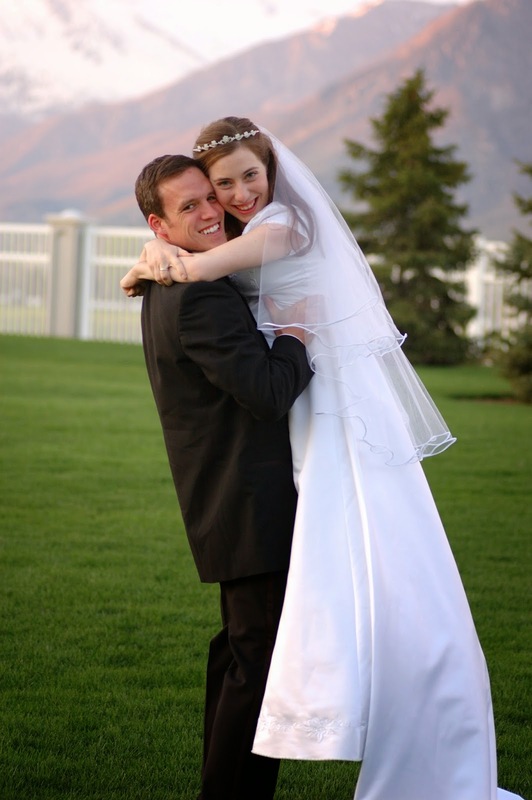 But there was no way to hide the fact that we've been married for a long time (for one thing, we were doing it at our house, and even though our kids were in bed, they were still there, making their needs known). Plus, Mike kept making comments that sounded exactly like things his grandpa used to say. It finally hit me: The time for pretending we're newlyweds is past. We don't look it or act it or talk like it. Ten years has turned us into an old married couple. A few weeks ago, I was thinking about our ten years, and I got to wondering if any of our physical possessions have lasted the entire ten years with us. There weren't many, but I scrounged up ten that I could share with you today in honor of the day. 1. The vacuum. We received it as a wedding present, and we're still using it today (although I wish we weren't. I think it's past its prime). 3. A blue plastic pitcher. My younger brother gave it to us, along with two matching cups, and we still use it frequently. 4. Our mattress. It was really the only thing we splurged on after we got married, and even though we'll probably get a new one in the next couple of years, it was worth the money we spent on it. We always miss it when we're traveling. 5. Our A.P.P.L.E. t-shirts. When we were dating, we created the A.P.P.L.E. club (that stood for Anti-Procrastination, Preparation-Loving Enthusiasts). For Mike's 22nd birthday, I had my uncle make shirts for us with our motto, "An A.P.P.L.E. a day will get you an "A," embroidered across the front. During my recent clothing purge, I almost got rid of mine. It was in the donation bag, but I rescued it. I realized that while most of my t-shirts from family reunions, races, and choirs have lost their sentimental value, for some reason, this one hasn't yet. It still brings a smile to my face every time I see it. 6. The microwave. Mike and I are amazed that it's still kickin'. 7. A chef's knife. I'm sorry to say I can't remember who gave it to us (I think it was one of Mike's friends? ), but it has definitely been one of our most-used gifts. Besides it, the only other knives we had were a cheap little $10 set (which we actually still use, btw), so this knife seemed especially nice. 8. A nightstand. It has actually lasted much longer than ten years since Mike made it as a sophomore in high school. It started out as an end table for us, then served as my nightstand for many years, and then recently got demoted to the spare room in the basement (but hey, we kept it!). 9. A lamp. I still love it just as much as when we originally unwrapped it. One evening, my kids knocked it off the table, and I was sure they'd broken it. I was so sad, but it survived. 10. Temple plate. We were sealed in the Mt. 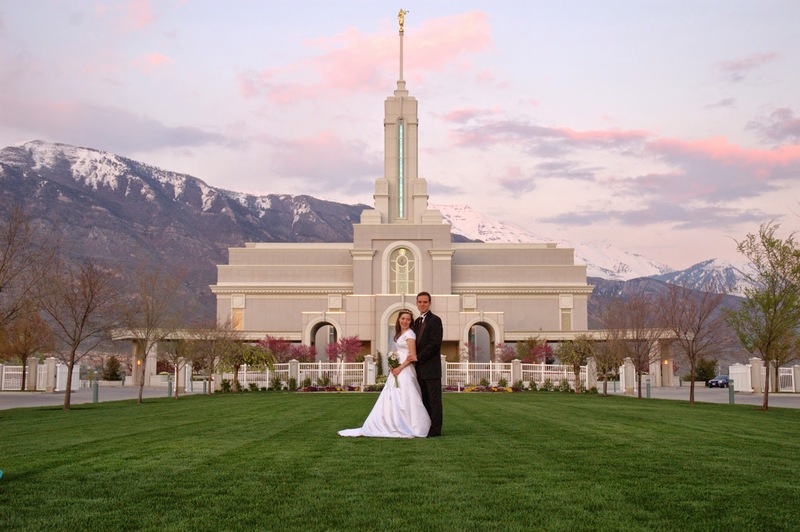 Timpanogos Temple, and so someone gave it to us as a wedding present. It serves as a reminder of the covenants we made, and have kept, for ten years. I'm reminded of the scene in These Happy Golden Years when Mary asks Laura, "Do you really want to . . . marry that Wilder boy? Why do you want to leave home and go with him?" Laura answers, "I guess it's because we just seem to belong together." That's what ten years have taught me. The past has been wonderful. The future looks bright. And Mike and I just seem to belong together. P.S. For more musings on anniversaries, see Eight is Great and The One. Congratulations on 10 years! Hope you have some fun celebrations planned! Happy Anniversary! Finding the person you belong with is something to celebrate whenever you can. Happy Anniversay! Congratulations on 10 years of marriage! Happy Anniversary! :D I think it was very clever of you to share ten object that have lasted lo these 10 years. Aw! Happy Anniversary, Amy! And congratulations on 10 happy years of marriage. You guys look like you belong together :) We just celebrated our 25th last week and it's kind of hard to believe that much time has gone by! Happy Anniversary! I remember when you had those T-shirts made. I'm glad you didn't throw yours out. You were a beautiful, happy couple then and you are a beautiful, happy couple now.